Somewhere in 2012 the notion of touring the country in an rv got into my head. It might have been a book I read or something I saw online. I slowly started putting this thought in Jeff’s head, knowing he would think it was just another crazy idea I’d get over. As the year went on, and I didn’t stop talking about it, Jeff began to try to wrap his head around that kind of lifestyle change. Note: I like change, he does not. I slipped in little tidbits about other people who have done it or are doing it. All of them loved it…their only regret being that they hadn’t done it sooner. Gradually, Jeff started to realize that this idea was not going away. Coincidentally, he had also secured a a work from home job that can be done from wherever a good cell signal exists. My job was stressing me out to the point where I didn’t think it would be sustainable long term. That, along with the truth that living in our current house and location was just too expensive, pushed him over the edge. We started looking at rvs. We we pleasantly surprised at how affordable they could be, especially at the end of the year when dealers are trying to get rid of older models. They were also a lot roomier than we thought…larger than a a lot of apartments. After doing some research into what brands had the best reputation and looking at a couple of used models, we decided buying new was for us (germophobia doesn’t hurt, either). There were several types of Keystone rvs which fit the bill. The options were incredible! You can have everything from a 2 bedroom with bunk beds in the back that sleeps 10 to a “toy box” design where the entire back folds down into a ramp to drive your off-road vehicle into. We needed something roomy enough for Jeff to have a workspace in as well as comfortable living space. We found all that in the 39′ Montana model. In July 2013, on a vacation to New Hampshire for Jeff’s parents’ 60th wedding anniversary, we debated whether to stop into yet another huge dealership. What could we see that we haven’t already? Well. We saw the exact model we liked, with the exact inside design and upholstery we liked, displayed inside the dealership on the showroom floor with all the lights on. Wow, did that make a difference. And the price was right. We went away and thought about it for one night then went back the next day and bought it. I don’t think we slept that night! It was exciting and scary at the same time. Never mind we didn’t have a truck that could pull it yet! Once home, Jeff worked very hard and found a used 2 ton GMC diesel pickup in Alabama. With a phone call to nephew-in-law Frankie in DC, he also found someone to go look at it, buy it and then drive it here. I named it “Growler” for how it sounds when you step on the gas. 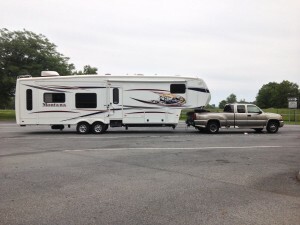 Jeff expertly backed it into our driveway and we spent a fair amount of time RVing in our driveway!